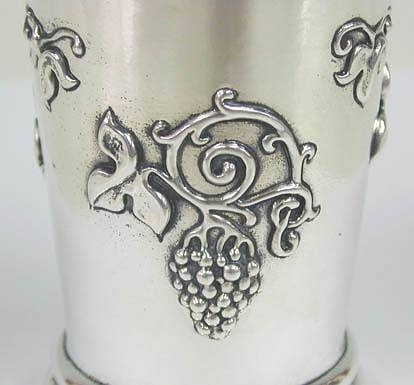 sterling silver (NOT silver plated) beaker / Kiddush cup An amazing artisan 925 sterling silver (NOT silver plated) beaker / Kiddush cup, Judaica. Beautifully decorated with superb grape and vine relief decorations while it is set on a round stepped base. 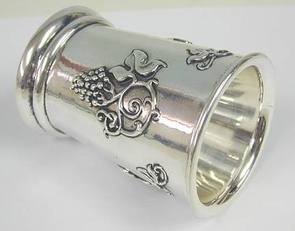 Although it was originally designed as a Judaica Kiddush cup for the Jewish Sabbath ceremony, it can also be used for other religions and ceremonies as well. This item was made in the electroforming method. Kiddush cup, Judaica. Grape and vine relief decorations set on a round stepped base. This item was made in the electroforming method. Weight: 160gr. / 5.144oz. Marks: 925 for sterling silver. Measurements: Height: 3in. / 7.62cm. Base: 3.4in. x 3.6in. / 8.636in. x 9.144in.